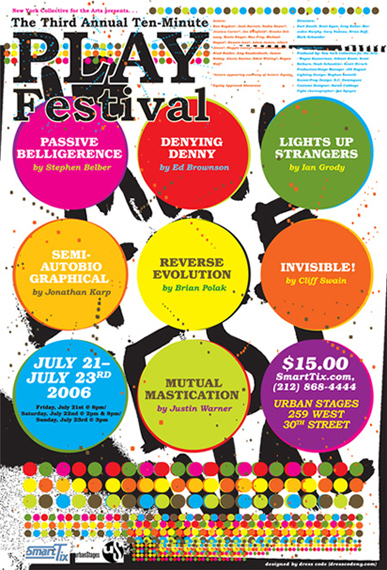 The Third Annual Ten-Minute Play Festival, produced by New York Collective for the Arts, took place over the weekend of July 21-23, 2006 with outstanding performances of world-premiere ten-minute plays by rising playwrights and established dramatists. This year's festival was presented in New York City at Urban Stages, 259 West 30th Street. This outstanding collection of ten-minute plays was presented by a talented array of rising actors, directors, and technicians and included new plays by Broadway playwright Stephen Belber (Match, McReele, Tape) and Jonathan Karp (How to Save the World and Find Love in 90 Minutes), publisher of Warner Twelve. The show was an amazing success, playing to sell-out crowds, and both the audience and the performers enjoyed themselves immensely. The mission of the NYCollective Ten-Minute Play Festival is to assist contemporary playwrights in developing their plays and careers and to provide theater professionals with the opportunity to engage in rich, challenging material. By producing shows that both challenge artist and audience, NYCOLLECTIVE THEATRE is rapidly becoming an important incubator and showcase for theatre artists. NYCollective received over 450 entries to our 2006 Competition. There were many fine submissions and the selection process was extremely difficult. Thank you to all of the playwrights who sent in their work. We encourage all of you to submit again to next year's festival. If you wish to be notified when the competition reopens in 2007, please click [here] and we will add you to our mailing list.